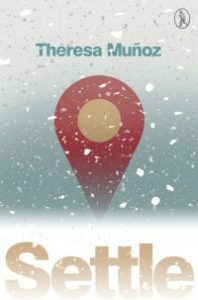 Theresa Muñoz is well-kent on the Scots literary scene, being published in many fine journals; she writes for both the Scottish Review of Books and the Herald, and her publishing credits reflect a continuing presence in Canada. Close (HappenStance, 2012) introduced her work in pamphlet form; Settle is her first full collection. That title is apt, as the first part of this two-sectioned collection deals directly with migration. Vancouver-born Muñoz left Canada to study at Glasgow University, and her crossing of continents is paralleled with her Filipino parents’ earlier migration. Characteristically kind and discerning, John Glenday offers great respect for performance poets who need to deliver their poem’s whole impact in one reading (though no-one would touch his own nuanced lines that quickly) and Muñoz’s highly narrative poems have that kind of performative immediacy, being direct in their imagery and readily accessible That may be good –after all what experience eclipses that of migration in our worrying world? We Scots must take note of poems like “Ashton Lane”, set in Glasgow’s most allegedly cosmopolitan corner, which finishes on the hellish words “hey – where did you buy her?” “Skin” opens with the equally damning, “Nice tan said a man”. This and her unwinding of being a stranger in an unfamiliar culture chime with her parents’ earlier struggles. I the cracked steps of the Giant’s Causeway. I I know about haggis and home rule. I Who invented the DNA molecule. I How to dispose of a broken fridge. I when coins were first shaped, or held. Holding Immigration procedures to account is seriously pertinent in 2016 and a subject well-suited to poetry. That’s not the problem. Why has the poet chosen to reiterate the poem printed a few pages before, only to recount, under an autobiographical narrative exactly the same story? That’s not simply a wasted rainforest – it insults both her reader and her poems. I can almost forgive the poet having a crisis of confidence (although this seems extraordinary), but her publisher can hardly be excused. This is not an isolated example, but characterises the whole section. Would the poet rather have written her tale in prose, as apparently she finds poetry insufficient for the task? Were that the book’s sum, I would have left Settle with a very sour taste. Here’s a truth of this smaller section…in telling poetically more adventurously of her digital life, Muñoz captures an aching loneliness of the recently-arrived, trawling the net for something or nothing which hits home as the collection elsewhere fails. This will take me back to Theresa Muñoz.